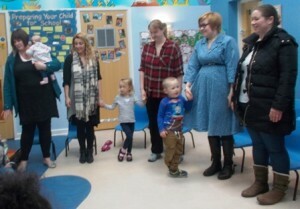 A group of parents went along to a Petit Poussins Parent Partnership Day at Kids 1st Wansbeck to see for themselves how the children learn French. Gill Nemri, the owner of Petits Poussins, ran the session ably assisted by Sebastien™, the Petits Poussins puppet mascot! During the classes, Gill only speaks in French as she strongly believes that this is the best way to learn a second language. “The Petits Poussins method is so visual that children easily understand what is being said,” she stated. The parents joined in the session which included singing songs such as ‘The Rainbow Song’, and ‘Jean Petit qui Danse’, picking mystery items from the ‘Sac à Surprises’ and enjoying lots of fun and games with Sebastien™. Everyone was very impressed when Gill asked ‘Comment t’appelles-tu?’ (what’s your name?) and the children answered ‘Je m’appelle’ then added their name. The Petits Poussins sessions take place weekly across all Kids 1st Nurseries. Kids 1st staff assist in the sessions so they can then reinforce some of the things the children have learned throughout the week. Petit Poussins Parent Partnership Days will be taking place soon at the other Kids 1st nurseries. If you are unable to attend, Gill is happy to answer any questions you have about your child’s learning experience. You can find learning resources used in the Petit Poussins classes on their website and Facebook/twitter sites.